In Mobile Interface Theory: Embodied Space and Locative Media, Jason Farman states, “Our representation of place using mobile media demonstrate the ways that mobile interfaces are transforming the information landscape around us.” Farman came to this conclusion in his chapter about mapping technologies and how the representation of space is influenced by those technologies. As a professor, Farman assigned graduate students a project to digitally map every surveillance camera on the University of Maryland campus. Farman and his students were surprised by the amount of cameras they located and pinned on to their digital map. It changed their perception of the campus, and some of his students began to see the environment of their university as a “surveillance space.” I found the idea of this changing perception of space, influenced by the use of mobile media and other technologies, interesting and very important. To Farman, the growing use of mobile devices is influencing the ways in which we experience, represent, and interpret the physical world around us. 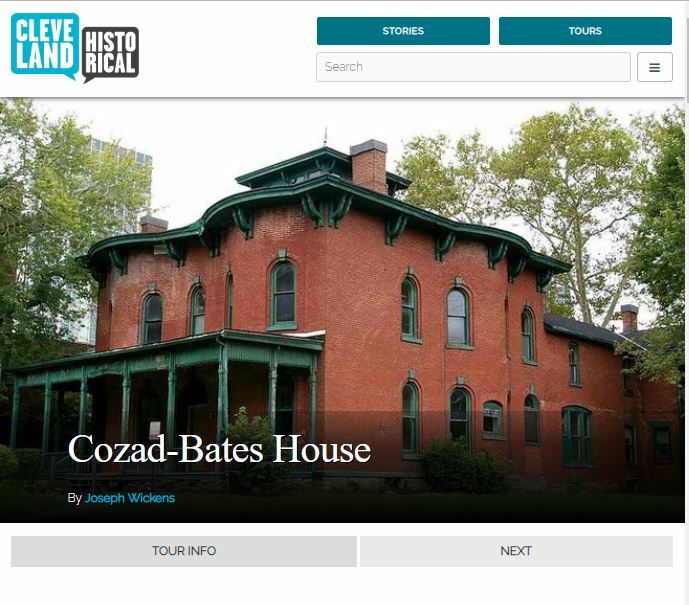 Mark Tebeau’s article about Cleveland Historical is a significant example of representing place using mobile media. 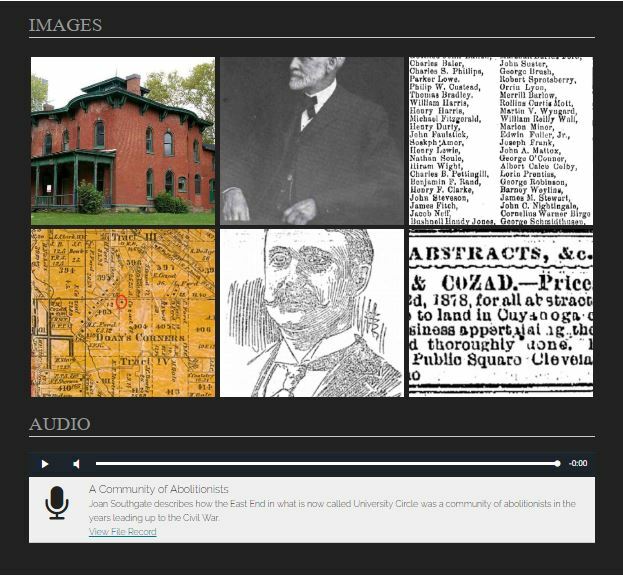 Cleveland Historical is a (free) mobile application that allows its users to explore the city’s history. Tebeau argues that this project actively reinterprets and “transforms the landscape into a living museum.” Using geolocation, Cleveland Historical pinpoints multiple historic sites across the city. Each site has its own page that includes its background information, photographs, documents, videos, and oral histories. Sites are also grouped together to create thematic tours (ex. Sports, Cultural Gardens, Underground Railroad, Immigration). A major goal of Cleveland Historical was to combine the physical landscape with digital media to create a better understanding of place. If a user was visiting a historic site included on the app, they would not only read about it in a short summary- they could listen to an oral history from someone with personal connections to the site, they could examine historic photos depicting it, or they could hear music associated with the location. By exploring their environment with Cleveland Historical, a user’s mobile app can become a window that allows them to re-imagine landscapes in a new perspective. Also important is that Cleveland Historical actively collaborates with the Cleveland community. Tebeau argues that working to create content for the app helps the public in the construction of their community identity and their own “understanding of place.” Sam Collins and Matthew Durington’s piece on the Chongno Alleys mobile application voiced a similar appreciation for collaborating with the public. This tour was developed by members of the community, including neighborhood residents. The goal of the app was to get tourists visiting Seoul to explore places in the city often overlooked. Collins used the app during a visit to Seoul and did end up experiencing the city and its community from a new perspective. Collins and Durington explored Chongno Alleys from a position as anthropology professionals, and encouraged others in the field to utilize mobile applications more in their work. They argued that it would result in a more engaged and active public audience, especially if that audience was able to participate in creating apps. This got me thinking- Quite a few of use (including me) are creating map-based digital projects this semester. Before this week’s readings- have any of you thought about how your project might be reinterpreting “place”? Also- if you can- have you reached out to any communities who might have an interest in what you are creating? After going through these readings, I am approaching my digital project with these questions in mind. Great post Melyssa! How digital mapping and our attachment to smartphones can be exploited for place-based learning has got me thinking about how virtual tours might be able to address the ever-present problem of funding that museums and parks face. At my current internship at the Atomic Heritage Foundation, we’ve been designing short vignettes based on oral histories with Manhattan Project scientists, family members, etc. It’s called “Ranger in Your Pocket,” and operates on the fact that a ranger is not always available to give tours of the national parks. Having visitors log onto a virtual tour while at the Los Alamos National Park gives people some context to the places they’re seeing, but also allows people to learn about the park from wherever they are in the world. But I wonder how these virtual tours could deal with more difficult histories. I know that Hiroshima and Nagasaki have began doing digital mapping to preserve survivor memories and interpret a mission of pacifism, but I’m wondering how you would address something like slavery, where there aren’t a lot of firsthand accounts preserved. Thanks for the thoughtful reply, Haley! You bring up a great point of virtual tours needing to be conscious of difficult histories- I completely agree with you. I think these virtual projects should start a conversation with their users about these difficult histories, and why there are so little first-hand accounts from these communities. I don’t think it’s right for tour developers to just say “We couldn’t find anything” and then just move on to the next thing. There needs to be recognition from both the creator and user about this history. Interpretation really matters with these subjects, so I don’t think it’s about simply mapping out places digitally, there are opportunities for more in-depth conversations and active public participation. Another great point you bring up is accessibility and opportunities to still have an interpretation of landscapes without the presence of an in-person interpreter! I’m really interested in “Ranger In Your Pocket!” I think it’s great that people can still explore the history of Los Alamos National Park if a ranger isn’t around. I also like how a broader audience can experience this history in the virtual tour, especially if they are unable to physically be at the park.